OK, so in the last post we talked about the feed-to-product ratio and how it depended only on the levels of enrichment you chose for the product and the tails. Tonight we’ll begin to get into separative work. When I first heard of separative work, I thought it was a very abstract and obscure concept. You read about it in a nuclear engineering text and they’ll talk about how it is the reduction of entropy in a mixture or something like that, and of course it is, but I think it is much more understandable than that. Separative work is all around us. My first experience with separative work probably came about when I was a kid and I talked my mom into buying me some Lucky Charms. You know you’ve done it—I poured the cereal and immediately began to undertake some separative work on the delicious mixture of little marshmallows and less-exciting brown cereal bites. Separative work on Lucky Charms gave you happiness in the beginning, but you also know of the depressing moment when all you have left from your separative work are the soggy “tails” of the activity. 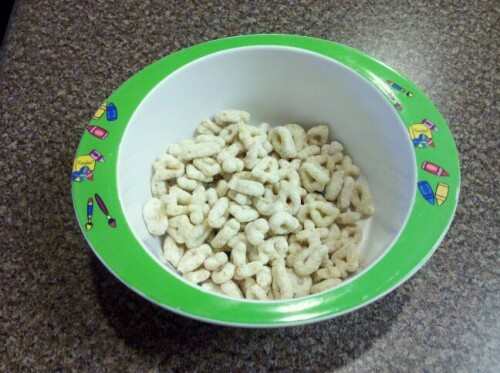 Later on, I realized that things would end a lot better if I ate the brown cereal at the beginning, thus “enriching” my Lucky Charms in little marshmallows. Then, after an appropriate increment of restraint, I could indulge myself in the culinary joy of highly-enriched Lucky Charms, and the sugar rush would send me running down the road to school. Last night, I observed my little daughter, who is not quite two and has not yet been formally schooled in the principles of separative work and enrichment, nonetheless showing an effective grasp of the principles when I let her have a handful of Lucky Charms. She immediately set to work—separative work—extracting the marshmallows from the handful of cereal and casting the “tails” on the floor of the kitchen. So I have high hopes for her future as a nuclear engineer based on her success with separative work thus far. The subtitle of this series has been “how I learned to quit worrying and love the SWU”, and SWU (pronounced “swoo”) is short for “separative work unit”, and it is a way to describe in a quantitative way this process of separative work. To separate one isotope from another in a mixture, we undertake separative work. Just how much separative work is required can be calculated using nothing but values of enrichment again, which is very handy. To calculate separative work, we use a function called the “value function”, which is based only on the value of enrichment. One might protest and say that a 50% enriched mixture of uranium is QUITE valuable, and in the real world one would be correct, but from the perspective of separative work, the least valuable mixture of all is the one where there is neither more or less of one component or another. And this makes sense if you stop and think about it for a moment. To have more or less of one component means that SOME separation has happened, therefore that mixture must have some greater value than a mixture of equal parts. So when we plot the curve of value function versus enrichment level, it looks like a deep valley, with the very bottom being at an enrichment level of 50%. Where xf, xp, and xt are the enrichment values of the feed, product, and tails respectively. Remember when using enrichment values in the value function, do not input them as percentages! You will get the wrong answer! You need to input them into the value function as decimal values, not percentages. The separative work is simply the mass of the product (mp) multiplied by its value function, plus the mass of the tails (mt) multiplied by its value function, minus the mass of the feed (mf) multiplied by its value function. But I had said earlier that I could show that separative work was only a function of enrichment levels, right? To do so just takes a few more steps. We know that feed, product, and tails are all related. But recall from our last discussion that the mass of the feed and the mass of the product can be related by the feed-to-product ratio, which depends only on enrichment. And that expression depends only on the enrichment levels of the feed, product, and tails. In the next post we’ll get into some specific cases where we use these expressions in real-world scenarios. What are the units of SWU? From the equations, they appear to be dimensionless (i.e., V() is dimensionless, FPR is a ratio, and therefore dimensionless, and there's literally nothing else). If I were to multiply product mass by the resultant number, I'd get a mass value. e.g., if I were to calculate the mass-independent SWU for enriching U-235 to 5% from natural(0.72%), with tails at 0.3%, I'd get ~1.619 (no unit). I don't understand what this number represents. "Separative work"? In Joules? I guess that the proper units for the answer would be kg*SWU/kg, which of course is just a SWU if you divide it out, which isn't exactly "dimensionless"…SWU itself is a dimension. A description of the reduction of entropy accomplished by a unit of separative work. The unit for separative work is kg SWU. More often written as tons SWU (or MTSWU), since a kg SWU isn't much. Don't try to compare it with physical work as in joules. Separative work lives in its own little world. The amount of actual work you need to accomplish an amount of separative work varies greatly based on the process. … So, it's the reciprocal of entropy?